The commemoration of all the faithful departed is celebrated by the Church on 2 November, or, if this be a Sunday or a solemnity, on 3 November. The Office of the Dead must be recited by the clergy and all the Masses are to be of Requiem, except one of the current feast, where this is of obligation. The theological basis for the feast is the doctrine that the souls which, on departing from the body, are not perfectly cleansed from venial sins, or have not fully atoned for past transgressions, are debarred from the Beatific Vision, and that the faithful on earth can help them by prayers, almsdeeds and especially by the sacrifice of the Mass. 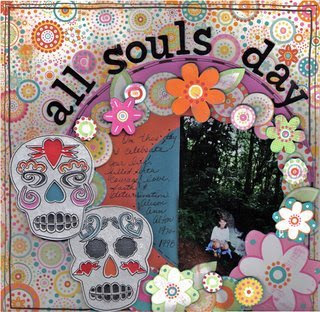 All Souls' Day commemorates the faithful departed. In Western Christianity, this day is observed principally in the Catholic Church, although some churches of Anglican Communion and the Old Catholic Churches also celebrate it. The Eastern Orthodox Church observes several All Souls' Days during the year. The Roman Catholic celebration is associated with the doctrine that the souls of the faithful who at death have not been cleansed from the temporal punishment due to venial sins and from attachment to mortal sins cannot immediately attain the beatific vision in heaven, and that they may be helped to do so by prayer and by the sacrifice of the Mass. In other words, when they died, they had not yet attained full sanctification and moral perfection, a requirement for entrance into Heaven. This sanctification is carried out posthumously in Purgatory.